This topic describes the Small Footprint Pivotal Application Services (PAS) tile for Pivotal Cloud Foundry (PCF). 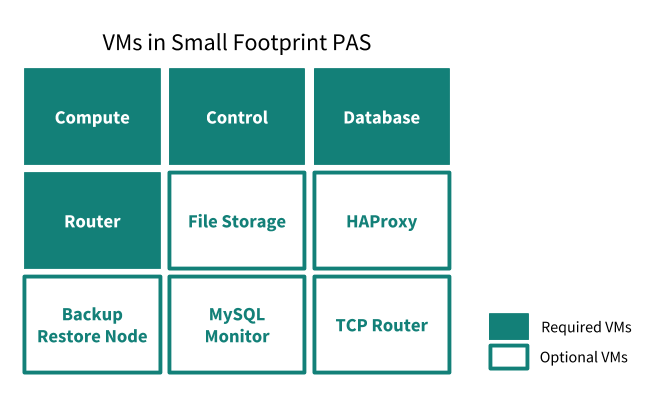 The Small Footprint PAS is a repackaging of the PAS components into a smaller deployment with fewer virtual machines (VMs). The Limitations section describes the limitations that come with a smaller deployment. A standard PAS deployment must have at least 14 VMs, but the Small Footprint PAS requires only four. The following image displays a comparison of the number of VMs deployed by PAS and Small Footprint PAS. Use the Small Footprint PAS tile for smaller PCF deployments on which you intend to host 2500 or fewer apps, as described in the Limitations section. If you want to use Small Footprint PAS in a production environment, ensure the Limitations described below are not an issue in your use case. Note: The Small Footprint PAS is compatible with PCF service tiles. Deploy PCF quickly and with a small footprint for evaluation or testing purposes. Use Small Footprint PAS as a PCF operator sandbox for tasks such as testing compatibility. Test a service tile against Small Footprint PAS instead of a standard PAS deployment to increase efficiency and reduce cost. The tile is not designed to support large numbers of app instances. You cannot scale the number of Compute VMs beyond 10 instances in the Resource Config pane. The Small Footprint PAS is designed to support 2500 or fewer apps. You cannot upgrade the Small Footprint PAS to the standard PAS tile. 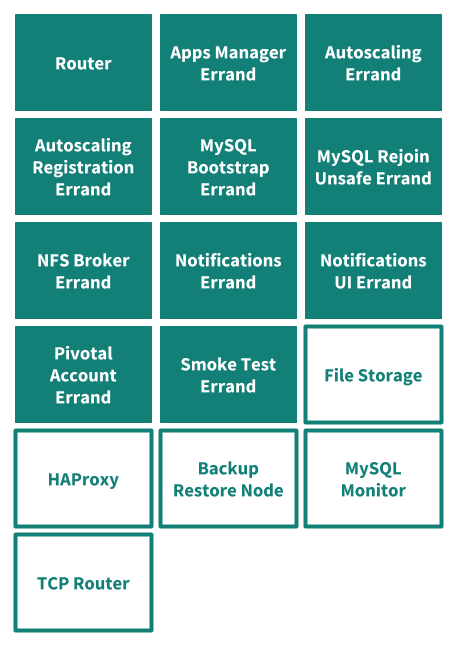 If you expect platform usage to increase beyond the capacity of the Small Footprint PAS, Pivotal recommends using the standard PAS tile. You may not be able to perform management plane operations like deploying new apps and accessing APIs for brief periods during tile upgrades. The management plane is colocated on the Control VM. If you require availability during your upgrades, you must scale your Compute VMs to a highly available configuration. Ensure sufficient capacity exists to move app instances between Compute VM instances during the upgrade. You can deploy the Small Footprint PAS tile with a minimum of four VMs, as shown in the image below. Note: The following image assumes that you are using an external blobstore. To reduce the number of VMs required for Small Footprint PAS, the Control and Database VMs include colocated jobs that run on a single VM in PAS. See the next sections for details. 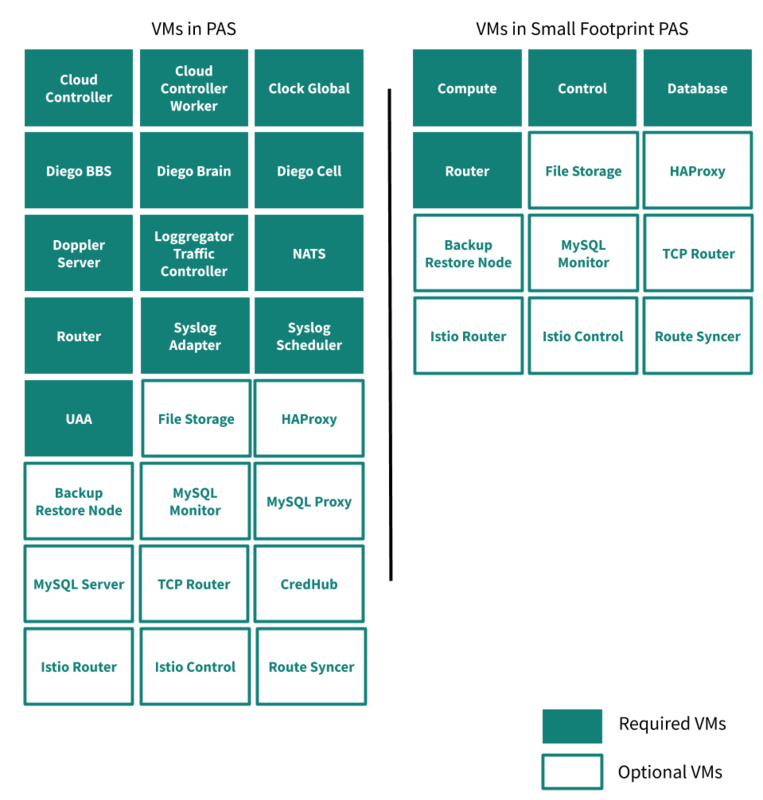 For more information about the components mentioned on this page, see the Architecture section of the Cloud Foundry Concepts guide. The Control VM includes the PAS jobs that handle management plane operations, app lifecycles, logging, and user authorization and authentication. Additionally, all errands run on the Control VM, eliminating the need for a VM for each errand and significantly reducing the time it takes to run errands. The following image shows all the jobs from PAS that are colocated on the Control VM in Small Footprint PAS. The database VM includes the PAS jobs that handle internal storage and messaging. The following image shows all the jobs from PAS that are colocated on the Database VM in Small Footprint PAS. The Compute VM is the same as the Diego Cell VM in PAS. The following image shows the VMs performs the same functions in both versions of the PAS tile. To install the Small Footprint PAS tile, follow the instructions for Installing Pivotal Cloud Foundry on your IaaS. When you navigate to the PAS tile on Pivotal Network, select the Small Footprint release. The Resource Config pane in the Small Footprint PAS tile reflects the differences in VMs discussed in the Architecture section of this topic. If you are using an SSH load balancer, you must enter its name in the Control VM row of the Resource Config pane. 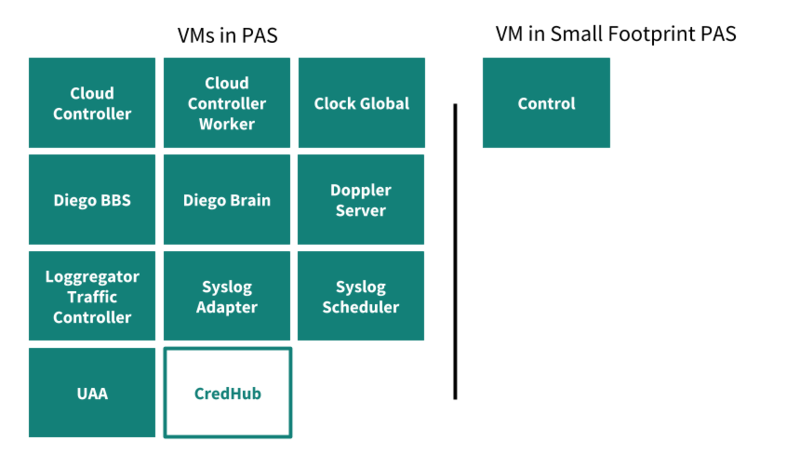 There is no Diego Brain row in Small Footprint Runtime because the Diego Brain is colocated on the Control VM. You can still enter the appropriate load balancers in the Router and TCP Router rows as normal. Note: If you do not know the name of your deployment, you can run bosh -e MY-ENV deployments to list the deployments for your BOSH Director. Use BOSH to SSH into one of the Small Footprint PAS VMs. Run sudo su to act as super user. Use monit to list the processes running on the VM. See the following example output that lists the processes running on the Control VM. The processes listed reflect the colocation of jobs as outlined in the Architecture section of this topic. The Small Footprint PAS tile releases alongside the PAS tile. For more information, see the PAS Release Notes.